Traditional gray bedroom: Benjamin Moore 'Revere Pewter', a photo by xJavierx on Flickr. Monochrome doesn't have to be boring, yo. When you're decorating with a tone-on-tone palette, use different textures and patterns to give the space depth and richness. In this Alabama house, interior designers Paige Schnell and Doug Davis of Tracery Interiors painted walls Benjamin Moore's Revere Pewter, a lovely pale gray that provides a nice contrast with the dark floors. 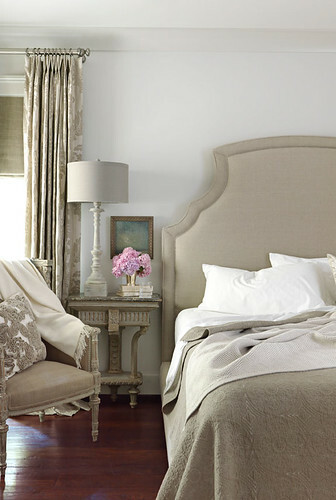 The Bernhardt bed in natural linen is from Three Sheets. Throw pillow from Ankasa. Photo by Jonny Valiant, House Beautiful.